Baba Salah is a guitarist from Gao in northern Mali who’s now based in Bamako. He’s best known outside his country as the guitarist for Oumou Sangare, one of Mali’s biggest international stars. In his home region he’s popular in his own right, with several cassettes on the market. Gao is a trading center and cultural crossroads; Salah’s first international release is a great introduction to his brand of Malian multicultural Afropop. He is Songhai, and like the most internationally famous Songhai musician, Ali Farka Toure, he plays a bluesy brand of finger-picked electric guitar. Track 3, with calabash percussion and one-stringed njarka fiddle to the fore, is Salah at his most Farka-like. He’s also influenced by the popular, gritty and rock-indebted Tuareg desert blues sound – 4 is an excellent example. 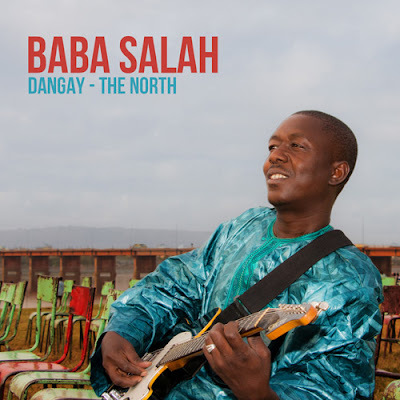 Salah is known for his virtuoso electric guitar solos – 2, reminiscent of Bambara bluesman Lobi Traore, shows why he’s in demand. He puts it all together on 1 and 9, tuneful Afropop songs with sympathetic band accompaniment that measure up with the continent’s best. Good stuff.